I’ve had a couple of contests here last year but this is the first contest I am sponsoring. 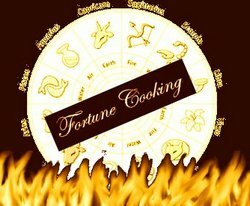 My wife Shriya & her friend Nithu are running their first ever contest in SpicyTasty.com – Fortune Cooking Contest! We have matched different zodiac signs with different food items. All you have to do is pick a sign and prepare a dish. The sign you pick can be yours or your family member’s or friend’s or even your pet’s. 2 Winners will be picked randomly and awarded these cool prizes! The First prize will be a beautiful jewel set ($25 value) sponsored by Lakshaya.com – A Fashion in a Click. Will be shipped to wherever you are. The Second Prize will be a $20 Amazon Gift Certificate sponsored by (shriya’s hubby) Shankrila.com. Yes, that’s me! I won’t ruin the fun of reading the whole juicy details at the contest post. But, you can easily enter if you have a blog or not. And it’s open to everyone and the jewel set will be shipped anywhere you are! How hard is it to share a recipe of a dish you make everyday and maybe share a few pictures of it? Contest ends June 1 2008 midnight EST. Winners will be announced June 6th at SpicyTasty.com and will have 48 hours to claim the prize. So make sure you grab SpicyTasty’s RSS feed! I like the idea of the contest. I think my wife will like this idea once she sees it. Are there any other details we will find out shortly? I’ve been thinking of running a contest on my blog as a means of marketing the site – do you have a tips as to how you run them? Should be an interesting contest for sure. Maria, sorry for the late reply. You can ask me anything about running contests using the contact form. I have run a few here and elsewhere and could provide you some pointers. Contestblogger.com has always some contests going on as well as a great forum. You could get some good idea there looking at the ongoing contests.